Hello! I love my cat! She is the best cat eva! Her name is Pepper and I am not 100% sure what kind of cat she is but I know she is super fluffy! So when I was asked to review this I thought she might be close to the ragdoll breed. Because the picture looks kind of like her, and it says radgolls are fluffy with silky fur. And that describes my cat. Your cat will think he/she is pretty high and mighty with food made ESPECIALLY for him/her! 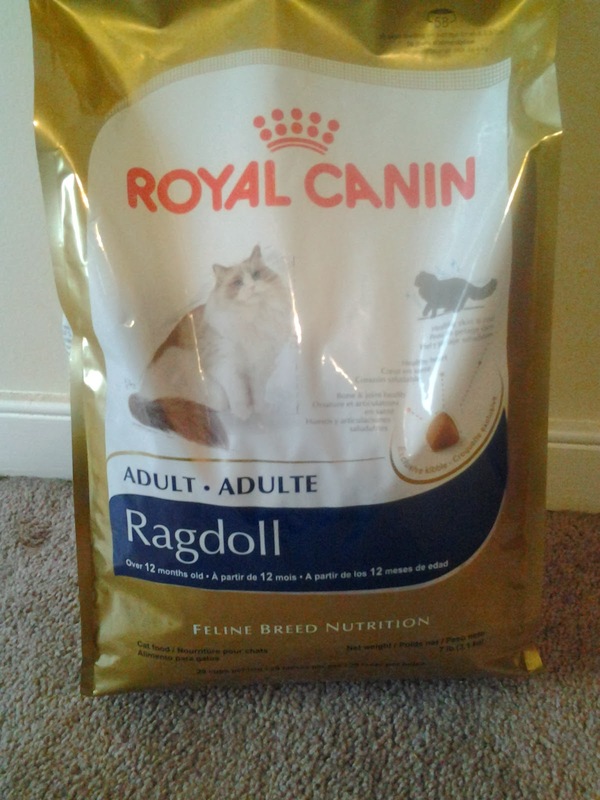 Royal Canin Feline Health Nutrition Ragdoll Formula Dry Cat Food is formulated for the health and nutrition of cats of the Ragdoll persuasion! With their trademark silky hair, this dry kibble has the nutrients needed to maintain all that fur along with all those other important features and feline bodily functions! Royal Canin Feline Health Nutrition Ragdoll Formula Dry Cat Food is a balanced and complete meal that caters to your rumbling Ragdoll! First I would like to thank the company for sending me a bag of this cat food. a 12 oz. sample size, but instead they generously sent me a 7 lb bag! and doesn't like. If she don't like it - she won't eat it. No matter what you do. when I usually fill her bowl up again. I noticed she hadn't really touched any of it. of the Royal Canin cat food and she started to eat it! She seemed to like it. breed specific products(such as Siamese, etc.) Visit Pet Food Direct. That is where you can also purchase this. I don't have a cat, but this sounds like great food. I miss my kitties. We rent so we can not have pets here. Sounds like you found a good brand of cat food for your cat. Have a terrific weekend!